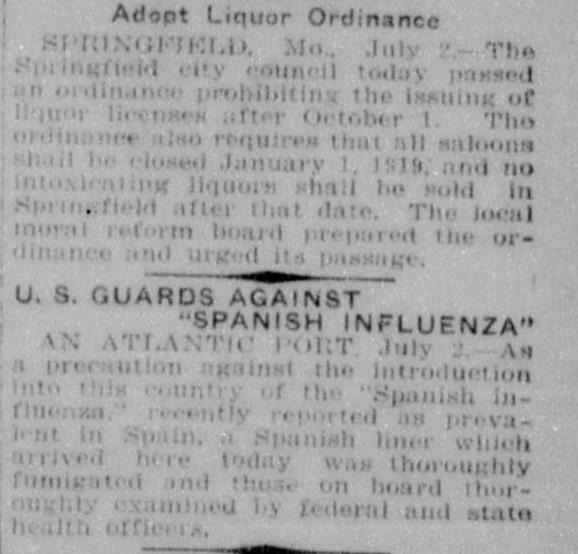 The CPI reports that a passenger ship arriving at an "Atlantic Port" from Spain is fumigated and all persons inspected as a protection against Spanish Influenza. Springfield, Missouri has set January 1, 1919 as the last day for the sale of intoxicating liquor. The Red Cross is helping the people of Tientsin as their community recovers from a river flood. Source: "U.S. Guards Against 'Spanish Influenza,'" Corpus Christi Caller, Corpus Christi, Texas, July 3, 1918. Page 4, Column 7.